I had a great time at RubyConf 2012. 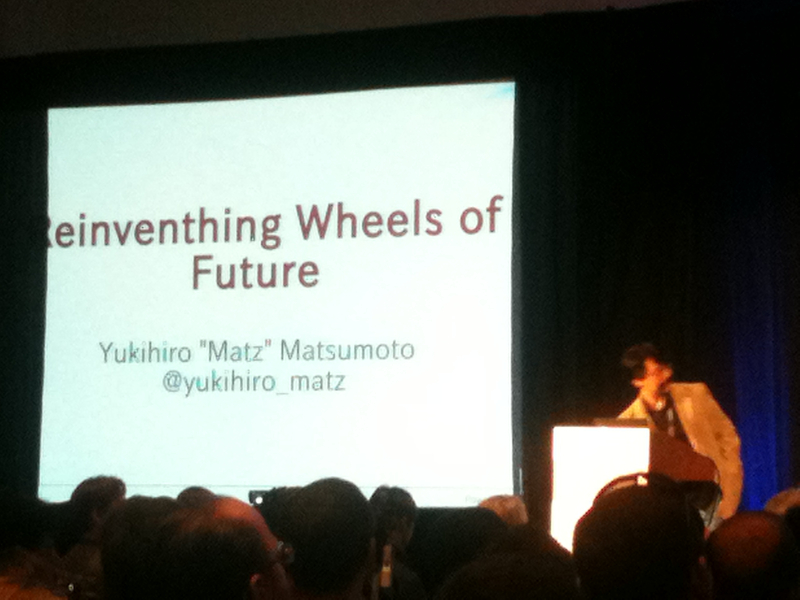 Matz kicked it off with a good, short talk on the importance of being happy. His speaker deck is online. Here are some of my notes from that talk. – Ruby a re-invention of the wheel? – Some criticized him for spending all the energy and attention on Ruby when Perl was just fine. – Limited resources / waste of time to create ruby when perl already exists? – What’s your motivation? To build website, have fun, money? – and one’s motivation is not to be put down. – Go ahead if you’re motivated. Even if it might waste your time, but it’s okay if it goes toward your motivation, for example fun. You’ll have a fun time even if it re-invents or fails. – Diversity is the cost of innovation. – We try. again. again. until we make innovation. It has costs, but is a good thing. – Feb. 24, 1993 – named “Ruby” so is considered the birthdate.